I’m not old enough to be nostalgic for the ‘80s. And yet, I am. Plus, Winona Ryder is one of my all-time favorite actresses (from the angst in Heathers, and Bettlejuice in the ‘80s to Edward Scissorhands, Girl, Interrupted, and Reality Bites in the ‘90s and more, she just got me). So when I heard about an ‘80s throwback show starring Winona Ryder on Netflix, I was in. And thank God I was. Stranger Things was incredible. I finished it in two days. And yes, the callbacks were endless. We had E.T. We had The Goonies. Stranger Things payed homage to Steven Spielberg, Stephen King and more. Aside from all the direct references, Stranger Things just had a very nostalgic feel- a Twin Peaks and X-Files vibe, like Super 8. And while Stranger Things felt so familiar, the references didn’t overwhelm it. It still felt fresh, and I still kept coming back for more. So what makes Stranger Things so great? First of all, the acting is impeccable. 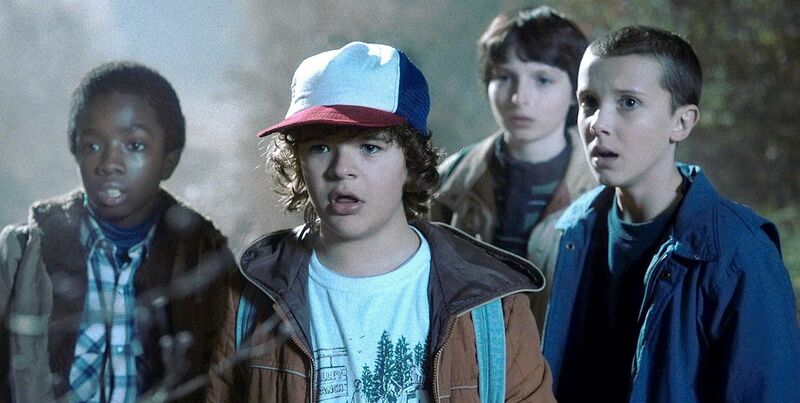 Yes, Winona Ryder rules but the kids really steal the show, especially Millie Bobby Brown as Eleven and Gaten Matarazzo as Dustin. I may just be a sucker for the weird kids, though. Basically, Stranger Things is a sci-fi mystery. Will goes missing and his friends and family try to find him. As they do, they discover the supernatural and the government’s involvement. After Will goes missing, you really do want to find out what’s going on at the Department of Energy lab and what that monster is. There’s just enough suspense and horror to keep the show going. Underneath that, though, this is really a coming of age story. It’s about childhood and friendship and relationships and being an outsider and fighting back against the grown ups and all those good things we’ve seen before. While Stranger Things has a great ending, it still leaves some questions open- where did Hopper go when he got in that car? Why is Eleven hiding? Will Will be okay? I can’t wait for season two. And yes, we’ve already been promised there will be justice for Barb.